Super covert spring expandable baton that multiplies your striking power. An impact weapon so small and narrow to fit into a jacket pocket but made of steel with a high quality knurled handle for better grip and black baked on finish. Rubber tip. Small steel telescopic baton with 3 collapsible sections. Only 7 inches long when closed and 3/4 of an inch in diameter, 16.6" when open (15 inches for the SB-16). Can be used as a kubaton, striking magnifier or baton. Great for Hotel security where it needs to be concealed most of the time. Weighs about 10 oz. Closes easily. 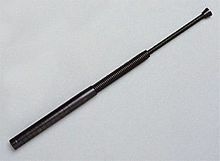 This is a very small baton, notice the dimensions above. It will not break any bones, however it can cause pain and help drive your attacker away. We have 2 models that are similar but not identical. The 220031 is a bit narrower and longer , 16.6 inches. The SB-16 is 15 inches long and a bit larger in diameter. The SB16 comes with a holster, the 220031 does not. This holster has a velcro top flap and a belt loop to run your belt through (Same holster for 4 oz pepper spray).